This basic, Old-Fashioned Apple Pie is a delicious way to use a pile of apples. 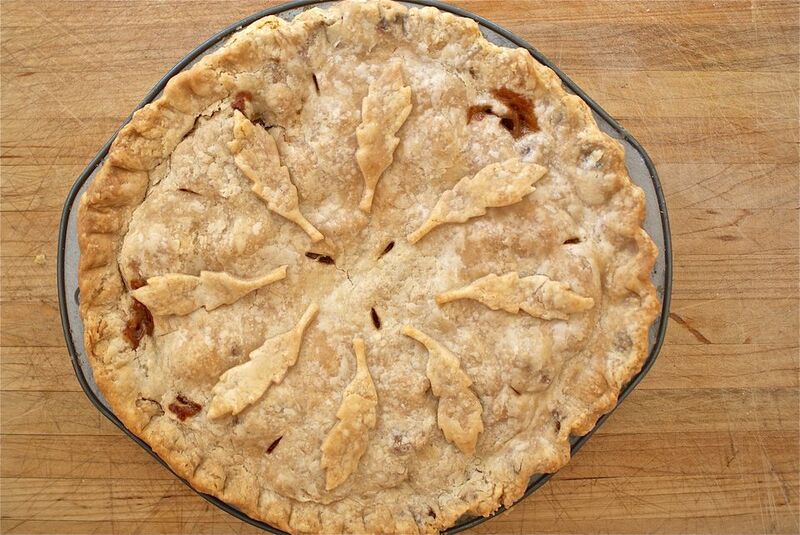 If you're feeling creative, find simple ways to dress up any apple pie. Make your pie as pretty as can be with by learning the art of pie crimping. Roll out crusts, if necessary. Wrap one crust in plastic wrap and chill. Line pie pan bottom with one crust, cover with plastic wrap and chill until apples are ready. Quarter, core, peel, and chop apples. Put apples in a large bowl with the lemon juice and toss thoroughly. Sprinkle apples with sugars, flour, cinnamon, nutmeg, salt, cloves, and all-spice. Toss until apples are thoroughly and evenly coated with the syrupy sauce that forms as you toss them. Preheat oven to 450F. Pour apples into the crust-lined pie pan and dot with butter. Place second crust on top, trim edges, and crimp edges as you like. Cut several vents in the top crust and decorate with crust cut-outs, if you like. Place pie pan on a large rimmed baking sheet. Bake for ten minutes. Reduce heat to 350F and bake until pie is well browned and bubbling inside, about 50 more minutes. Let cool thoroughly (at least 1 hour) before cutting. Apple-Pear Pie - Substitute half of the apples with cored, peeled, and chopped pears. Increase flour, cornstarch, or instant tapioca to 3 tablespoons to control runny juices. Apple Ginger Pie - Add 1 tablespoon grated fresh ginger or 1 teaspoon ground ginger to the apples. Apple Streusel Pie - Use only 1 crust and instead of topping the pie with a second crust, sprinkle pie with 1/2 cup butter, 1/2 cup brown sugar, 1/2 cup rolled oats, 2 teaspoons lemon juice, and 1/2 teaspoon ground cinnamon that you've either worked together by hand or pulsed in a food processor. Cardamom Apple Pie - Use 1/2 teaspoon ground cardamom instead of ground cinnamon. For the best aroma, grind your own cardamom from the seeds of a cardamom pod. Cheddar Apple Pie - Make your own crust and add 3/4 cup grated cheddar cheese. Dutch Apple Pie - Increase thickener to 3 tablespoons. Cut a large vent in the center of the pie. After the pie has baked for 30 minutes, pour 1/2 cup heavy cream into the vent hole. Finish baking as described above. Spicy Apple Pie - Double spices in the above recipe and add 1/2 teaspoon finely ground black pepper.